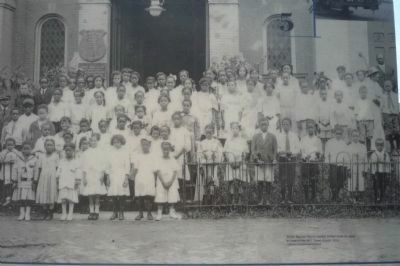 Washington’s first black Muslim temple opened in 1940 when the Nation of Islam established Temple No. 4 at 1525-1527 Ninth Street. The Nation of Islam’s second national leader, Elijah Muhammad (1897-1975), presided over the event. Founded in Chicago in 1931 by Wallace Fard, the Nation of Islam stands for discipline, racial pride, and respect for women, Allah and the Qu’ran, justice, pacifism, and the separation of African Americans from White society. In 1960 the temple, renamed Masjid Muhammad Mosque, moved nearby to 1519 Fourth Street where Malcolm X briefly served as its leader. building. Unbowed, Shiloh members repaired the church and flourished. The church was rebuilt after another major fire in 1991. 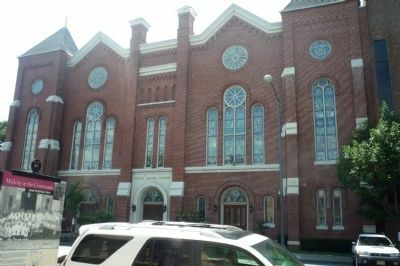 Like other churches in Shaw, Shiloh, with its Family Life Center, serves as a social gathering place. Shiloh is especially known for its Civil Rights work, housing assistance, and music ministry. 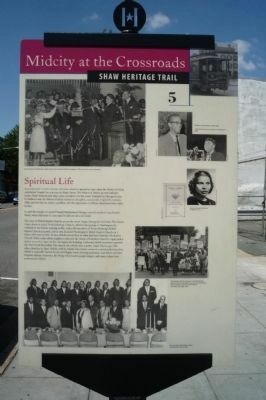 Soprano Marian Anderson, the Wings Over Jordan gospel singers, and many others have performed at Shiloh. Location. 38° 54.591′ N, 77° 1.432′ W. Marker is in Shaw, District of Columbia, in Washington. Marker is on 9th Street Northwest north of P Street Northwest, on the right when traveling north. Touch for map. This is marker five of a set of seventeen included with this Cultural DC Heritage Trail. Marker is at or near this postal address: 1500 9th Street Northwest, Washington DC 20001, United States of America. Touch for directions. Other nearby markers. At least 8 other markers are within walking distance of this marker. Carter G. Woodson House (about 400 feet away, measured in a direct line); Working for the Race (about 400 feet away); Alley Life (about 500 feet away); The Fires of 1968 (about 600 feet away); Phyllis Wheatley YWCA (about 700 feet away); Community Anchors (about 800 feet away); When Gordon Met Ella (approx. 0.2 miles away); Immaculate Conception Catholic Church (approx. 0.2 miles away). Touch for a list and map of all markers in Shaw. More. Search the internet for Spiritual Life. Credits. This page was last revised on March 18, 2019. This page originally submitted on March 6, 2010, by Richard E. Miller of Oxon Hill, Maryland. This page has been viewed 1,160 times since then and 10 times this year. Last updated on March 8, 2019, by Devry Becker Jones of Washington, District of Columbia. Photos: 1, 2, 3. submitted on March 6, 2010, by Richard E. Miller of Oxon Hill, Maryland. • Bill Pfingsten was the editor who published this page.